“I loved the blueberries in last year’s Stumptown Tart and ever since it came out I’ve been thinking about what would pair well with blueberries again. We played with the tartness of cranberries against the mellow sweetness of the blueberries and the whole brewing staff is pretty pleased with how it turned out. Trying out new fruit year to year challenges the brewing team and this year’s Stumptown Tart was no different. 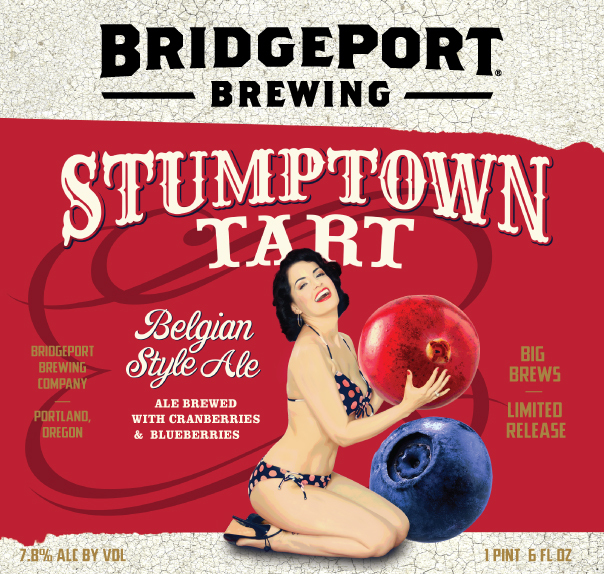 BridgePort will host a Stumptown Tart release party Thursday, May 15 starting at 5:30 p.m. at the BridgePort Brewpub in Portland. Come be one of the first to try this year’s beloved Stumptown Tart. Bottle label model Bernie Dexter will also be there ready to pose with guests for photo opportunities and to personalize guests’ bottles with an autograph. For $1, guests can snag a smooch from the Stumptown Tart herself along with a picture in the kissing booth. All Donations will go to The American Cancer Society. Ingredients: Pilsner malt, white wheat malt, Belgian yeast, ale yeast, lager yeast, blueberries and cranberry puree. Description: Brewed with two row pale malt and malted white wheat, the 2014 edition of this big Belgian-style ale features the crisp sweet and tart balance of Oregon blueberries and cranberries. The hazy brew is double fermented and only lightly filtered to retain the fresh fruit flavor. Celebrating 30 years in 2014, Oregon’s oldest craft brewery continues to evolve from a microbrewery to a regional leader committed to producing high quality craft ales. Lead by Brewmaster Jeff Edgerton, the team of BridgePort brewers prides itself on using hops from an hour away and clear glacial water from Mount Hood. The BridgePort family of ales includes IPA, the Hop Czar IPA Series, and Kingpin. BridgePort Brewery is located at 1313 N.W. Marshall St.